Research in the Department of Biology at California State University, Northridge isn’t just being done by faculty and students. The recent release of the 21st edition of the annual New Journal of Student Abstract is evidence of CSUN’s commitment to K-12 science education in its community. The journal features a variety of experiments, from the science of dance and dizziness to the use of cinnamon as a natural substitute for pesticide. More than 200 abstracts by middle and high school scientists are featured in the journal. For the past 21 years, biology professor Steven Oppenheimer has collaborated with Los Angeles Unified School District (LAUSD) and private school teachers to promote science, technology, engineering and mathematics (STEM) for K-12 students. “There is a need for people to get involved in science at a younger age,” Oppenheimer said. Terri Miller, a former middle school teacher, has helped students with the journal since 2000 and currently volunteers at the Saint Catherine of Siena School in Reseda, where she helps students do their research. Miller’s students worked with collembolans, insects the size of a speck. One group of students wanted to see if plastic would cause the community of insects to increase or decrease. Students worked with two groups of collembolans, placing a piece of plastic in one of the groups. In the end, the students found that adding plastic to the communities would cause the collembolans to increase. The journal started as a teacher training program in 1985. Oppenheimer collaborated with Nobel Prize-winner Francis Crick, the molecular biologist who helped discover the molecular structure of DNA, to organize training seminars for teachers. Teachers who completed the program took what they learned to their classrooms. In 1995, the journal was created as a place for teachers to compile their work and lectures. It has since evolved into a showcase for student research. 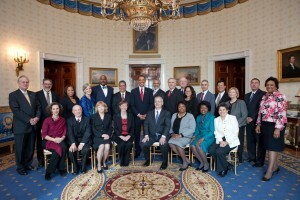 Oppenheimer was honored by President Barack Obama for his dedication to the program and students in 2009. Hundreds of his research students have gone on to become doctors, dentists, professors, scientists, teachers and pharmacists. The middle and high school students who contributed to the latest journal are invited to attend the a research symposium on March 18, 2017 at 1:30 p.m. in CSUN’s University Student Union Grand Salon, located on the campus at 18111 Nordhoff St. in Northridge. They will have the opportunity to present their research posters and receive a medal for their work. “I’ve seen more excitement when the students receive their medal at the symposium, than at a football game,” Oppenheimer said. Parking on campus costs $8, and permits are available at http://www.csun.edu/parking/student-parking-information. Free copies of all the journals are available online: http://scholarworks.csun.edu/handle/10211.3/125029.